This entry was posted in Journalism, Saudi Arabia and tagged Arab News, Dr. Abdullah Al-Rabeeah, editorial standards, media, Ministry of Health, Reham, Reham Al-Hakami, Saudi Arabia, saudi gazette by alexofarabia. Bookmark the permalink. Arab News did cover the story of Reham (and still does) in so many different issues. Comparing the same story in 2 different news resources of only one day, doesn’t make sense. The various stories published on Reham’s story published on Arab News do not always support AlRabeea. 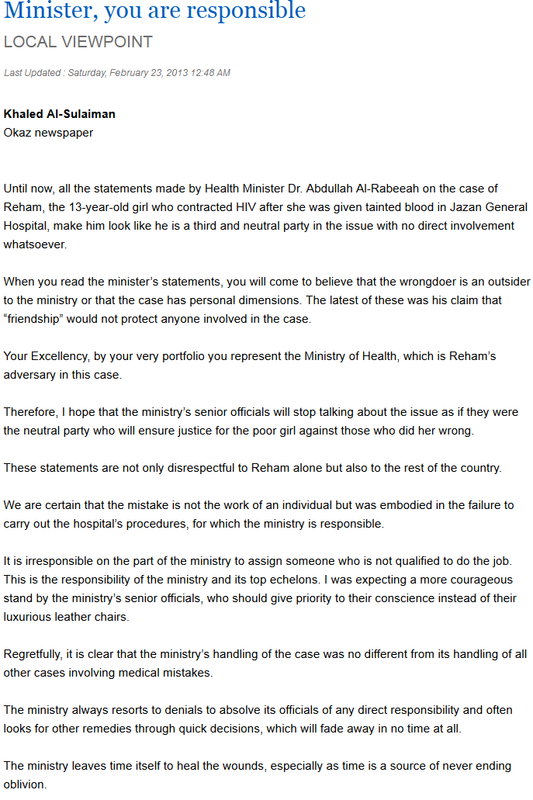 I read through Arab News that the story of Reham was discussed in Shoura council and the members were openly criticizing the ministry of health. Thanks for your post. I’ll keep visiting. Thanks Hayat for your comment. What I was referring to was a specific point in time; your point is spot on and completely valid. However, generally speaking I feel that Saudi Gazette has improved significantly under its new leadership while Arab News isn’t as strong as it once was, which is a shame. And do let me know more of your views on the Saudi pieces. I’m a Saudi journalist in Arab News and worked with Khalid Maeena and now Muhammad Harthi. It may be biased to say there’s more renovation of ideas now than before as I am part of the panel. Arab News is moving to be more Saudized, in order to increase the target audience. I wish Saudi Gazzette all the best under Khalid Maeena authority. I welcome any views and ready to get your concerns delivered if you want. I’m a big fan of both localization and of local talent – many of the best reporters at Arab News were Saudis and still are Saudis. However, I do feel a different tone was taken under AlFaiz, which was to drive revenues. While I welcome a number of the initiatives taken by the paper under AlHarthi (especially on the digital side) I feel that more can be done editorially. I hope to read more of your stories in the paper Hayat.